Orlando, FL – The United Kingdom is second only to Canada when it comes to the number of annual visitors to Florida. More than 1.6 million Brits visited the Sunshine State in 2015 due to its unique combination of warm weather, plenty to do for the entire family and favorable exchange rates. As the world’s single largest tourist destination, Orlando has more than 66 million visitors annually. Subsequently, affordable pricing and reliable rental returns have made Orlando a top choice for many property buyers. The recent decision by voters in the UK to leave the European Union (EU) has led to instability in the financial markets. For savvy Brits looking to diversify their investments, the acquisition of US holiday property is an increasingly popular option. The Orlando vacation home market presents buyers with a variety of choices. Single-family homes, townhomes, villas and condos are all available in close proximity to Orlando’s world-famous attractions. Finding the right one for you can be a daunting task. Engaging a local Realtor can help take the guesswork out of the process and save you time and money in the long run. Evaluating how you’ll use the property will also help you narrow down your choices. Do I want to be able to rent out my property when I’m not using it? Am I prepared to manage the rental process myself, or should I engage a property management company? How do I choose from the abundance of property management companies available? Do I want a single-family home and the maintenance that goes along with it, or would a ‘lock and leave’ condominium style property be better for me? Would my family prefer a neighborhood-type setting or a resort setting with amenities and activities? How important is location? Do I want to be close to Disney? Major roadways? How will my family use the property? Will we simply sleep there in between theme park visits, or would we prefer to take some time to relax at pools, spas, etc? The Grove Resort & Spa, Orlando’s newest and most exciting vacation resort destination, is the obvious choice for buyers who want a turn-key holiday property in a resort setting. 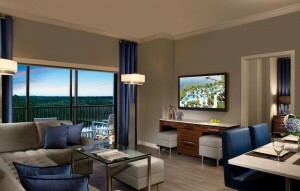 Located just five minutes west of Walt Disney World® Resort, prices for two-bedroom condominiums start from the $250,000s. On-site hotel management group, Benchmark International will handle all the details in renting of your condominium while you’re not there. Their professional staff will tend to housekeeping and other services while your holiday property is occupied. The Grove Resort & Spa will feature a world-class, family-friendly water park and amenity package with the first surf simulator at any Orlando vacation home community or hotel, a lazy river winding more than 725 feet (221 meters), three swimming pools collectively known as The Springs, a large zero-entry resort pool and dining options that include three restaurants and four bars. A destination unto itself, The Grove is the ideal place for families to relax and reconnect. With activities to please anyone from age 6 to 60 (and beyond! ), owners and guests are sure to schedule several days of their holiday on property swimming, dining and enjoying the countless amenities available here. The Grove Resort & Spa is now selling its two-and three-bedroom condominiums. Prospective buyers are welcome to tour the property with a Realtor or on their own. The on-site sales team will provide expert insight on the property, its extensive amenities and the hotel rental program. They’ll also be there to guide you every step of the way through the purchase process. The process for purchasing property in the U.S. may differ from that in the U.K. First, the buyer and seller will draw a contract detailing the conditions of the sale, which also includes title checks and property inspections. Both parties are represented separately, acting through a broker. A deposit of at least 10 percent is paid at this point. The property buyer forfeits this if they withdraw from the purchase. If the property fails to meet the conditions of the sale outlined in the contract, the deposit is refunded. The buyer and seller then both appoint a title company in order to complete the transaction. The new owner pays the balance due and both parties sign the final documents. The transfer of ownership is then registered with proper local entities. The Grove Resort & Spa is now selling its first phase of up to 292 residences. Deposits will be collected at the time of contract, with closings scheduled prior to the first phase grand opening in January 2017.